His ground breaking report is written up here: “Is the U.S. Surface Temperature Record Reliable?”. My short summary from the Skeptics Handbook is here: The main “cause” of Global Warming is air conditioners. There’s a YouTube interview with Anthony and Johnathon Coleman which shows site after site from his survey. You don’t need to be a scientist to see why these temperature gauges are measuring something other than global warming. 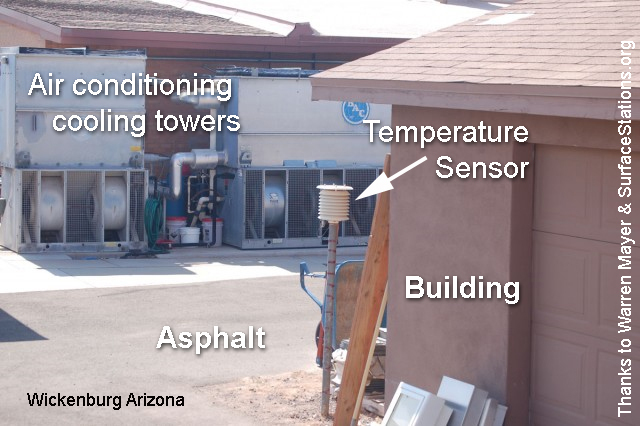 Wickenburg Arizona Surface Station: where you can get an accurate measure of a parking lot temperature (warmed by industrial air-condtioners). Anthony Watts teamed up with Joe D’Aleo to write a paper a few months ago with devastating examples of how we’ve been deceived through manipulation of data. Seventy five percent of temperature stations have been dropped from the compilations in the Great Dying of Thermometers. The great David Archibald is touring with Anthony Watts. Another self-starter with initiative, David is a journeyman scientist, trained in geology. He was working as a mining stock analyst when (a bit like Steven McIntyre) alarm bells rang as he listened to the Global Warming message. He tells me he recognized the language as the same spin people use to sell dodgy stocks and projects. David lives in Perth, and yes, we’ve become good friends since we met in Bali (at the UNFCCC). Over the last few years David has had a better track record of predicting solar activity than NASA. His book Solar Cycle 24 came out a year ago. He was the one who created the first public log graph that graphically captures just how little effect extra carbon directly has on global temperatures. He published a paper in Energy and Environment in 2006 drawing attention to the connection between the length of solar cycles and global temperatures. 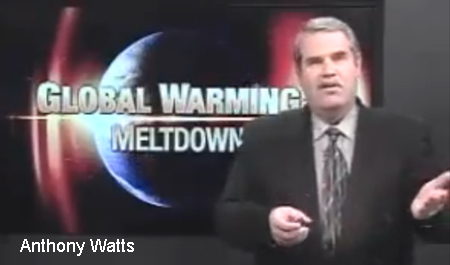 He recently wrote about the solar flux predicting cold years to come on Watts Up. David is a straight talking character who tells it like it is. Stockwell runs a very well respected blog — Niche Modeling. He’s an expert on modeling ecological niches, published multiple times in top journals, and his blog reflects his in-depth knowledge. He’s a no fuss, hard numbers man: Show me the evidence. One of his key aims is to get predictions right and he keeps tabs on his scorecard vs AGW. He has been vindicated many times. I’m sorry I won’t get to meet him this tour. His blog is one of those with hard-to-earn-kudos for discussing difficult topics, and always with faultless logic. A range of other skeptics, including myself, will join in the tour for parts. I would have done the whole 18 towns too, if only I didn’t have other commitments. The Climate Sceptics Site has all the details. Just $20 in smaller towns and venues. Rockdale Town Hall, 448 Princes Highway (corner Bryant Street). Anthony Watts, David Archibald and Tim Curtin. Ignatius Park College Assembly Hall, 368 Ross River Rd, Cranbrook. Anthony Watts, David Archibald, Peter Ridd and Bob Carter. Gee,Jo, you couldn’t squeeze an extra one in here, in Suva, could you? But anecdotal pictures of badly placed thermometers do not a scientific study make. You have to take all this information and see if it actually makes a difference to the surface record. Menne 2010 (PDF) did just that, and indeed found a very slight bias: a cooling one. In addition, the surface record is in large agreement with Spencer’s satellite, so if there is a warming bias from microsite or UHI, then somehow the same bias is influencing the satellites. Hammiesink, the Menne “study” has already been debunked. But don’t you think it’s unrealistic to compare temperature records from the early 1900′s (or before} when the weather stations have been modified to include asphalt surroundings and air conditioner exhausts (if not Boeing jets) blowing into the Stevenson screens? If not, then I advise you to up your medication. It’s a pity the tour can’t call in at the UK. They could do Norwich (home of CRU and UEA) and Exeter (home of the Met Office), which is just round the corner from me. Doesn’t look like a debunking, just an urge to wait for him to finish the project to see if it really makes a difference. Watts says as much at the end of the article. But don’t you think it’s unrealistic to compare temperature records from the early 1900’s when the weather stations have been modified to include asphalt surroundings and air conditioner exhausts (if not Boeing jets) blowing into the Stevenson screens? The graph is from 1979 onwards, when satellites first began. Also when global warming first emerged from the background variation. I.e., the important part. If AGW is just a statistical mistake, you would think the surface record would diverge considerably from the satellites. Right? Nothing but their wits…and the truth. Aren’t these dudes just awesome! No one Ever looks like you might picture them…. I have always suspected (without any empirical evidence) that the icon is generated by an algorithm that substitutes graphical components for the letters in your name. I always appear to be the same sea-sick individual whichever site I go to. However, I now notice that your comment #10 and comment #12 have a different icon, although the name stays the same – were you at another location, or using another machine, by any chance? How does one change the “emoticon” (horrible word) to a pictorial icon. I would like the opportunity to look as handsome as Baa Humbug’s horse. Your comment looks suspiciously like a straw man to me. Lets just unpick the problem here, shall we? 1. Mean global temperature is increasing, and has been for centuries. 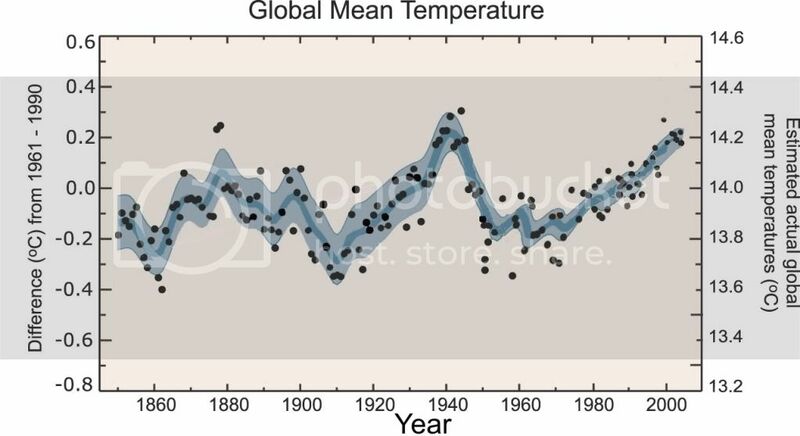 A plot of mean global temperature for any period shows a definite linear trend, with a consistent slope. Everybody agrees with the overall “GW” bit. 2. But, there are minor perturbations at shorter time-frames, and that is where the focus lies. In an engineering sense, this debate is all about the noise and nothing about the signal. 3. The noise is primarily made up from solar cycles, seasonal changes, natural weather cycles, natural oceanographic cycles, the cyclic absorption and out-gassing of carbon dioxide from the oceans, volcanic activity (both surface, and submarine), et al. A lot of which, we know little about. 4. And then we have the arcane ways in which we measure all of the above (or don’t in most cases): Most of the historical temperature readings were taken manually, often in adverse conditions, and using equipment that was rarely, if ever, calibrated. We are lucky if it is accurate to the nearest degree or two. 5. But wait, there are other contributors to the noise: physical environmental changes; equipment inaccuracies; equipment replacement; equipment movements; and others – one of which might, just might, be an increase in temperature due to human activities. 6. But how do we know how much can be attributed to anthropological sources – the ‘A’ in “AGW”? Because of all of the above problems, the detailed readings have been “adjusted” (without records being kept), and homogenised (without records being kept), and sites excluded (without apparent reason). We have even “adjusted” the now-much-vaunted satellite readings to “align” with the terrestrial records. And in all of this adjustment activity, it appears to be the “cooler” sites that are down-played rather than the “warmer”. Even if we assume the adjustments are warranted, we would expect a normal distribution of the results. So we still don’t know how much of the warming, if any, is due to us. If you have a figure, and can show the calculations, please share it with the rest of us. Of course, those in the “need-a-creed” crowd will pooh-pooh all of the above as being irrelevant, because they all know that all of the current warming is due to mans’ original sin of inventing the internal combustion engine. If you disagree, please comment on my points, I would just love the opportunity to expand my limited knowledge. Global warming is about the increasing long-term trend, not the noise. Many skeptics seem to want to imply that the globe isn’t warming at all; that it’s just a statistical error. Spurious warming trends and the like. But clearly, Roy Spencer’s satellite is largely in agreement with the surface record, so this would seem to vindicate the surface record. 3 pages of utter drivel. how embarrassing is this magazine? This is supported by Edward Long, who found that good quality rural US sites are warming at a gigantic 0.11 C/century, before being unjustifiably adjusted by NCDC (who have been busily saying its worse than we thought to the US Congress this week, oh and give us more money). Now I don’t know what the error bars on the 0.11 C/century datum are, but it might take a while for us to boil, fry and melt at that rate. You will see that the ‘rise’ rate since 1979 is the same as between 1900 and 1940 when CO2 levels were a lot lower, so how can CO2 have caused this ‘emerged’ ‘warming’? Not any one, or Anyone, that any of us know of, hammy. 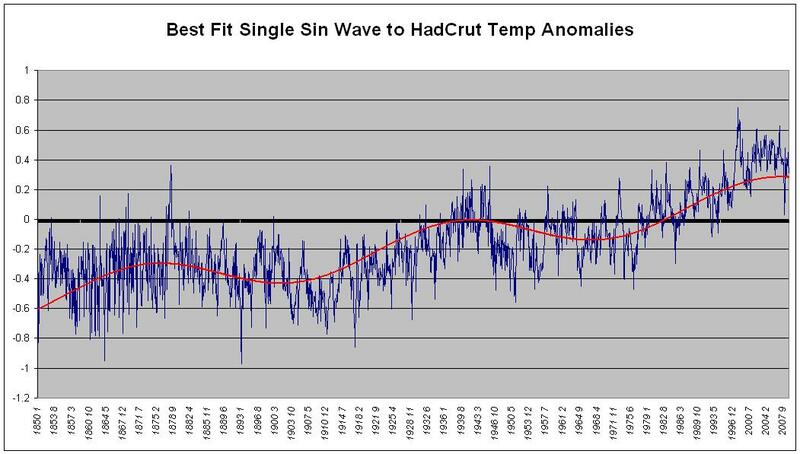 In fact graphs of the cycles of warming and cooling have been posted on this blog several times, and there is Nothing spurious about the natural back-and-forth nature of the trends. The only difference in the long run is the Strength of the natural trends, and that varies depending on a great deal of circumstances, including the orbit of the planet, solar geomagnetic activity, the PDO, the AMO, and so on, and so forth. Daily data include observations of maximum and minimum temperature, precipitation amount, snowfall amount, and snow depth; monthly data consist of monthly-averaged maximum, minimum, and mean temperature and total monthly precipitation. Does anyone spot the missing measure? Where is the measurement of GHG concentrations? How can any statistical analysis be derived when there are not two simultaneous measurements of supposedly related parameters? Ummm no… I can’t think of any sceptics who are jumping up and down and shouting the globe is not warming. Most of us are saying that the warming we have experienced in the thermometer history is hardly alarming, and we expect the future to be no different (i.e. not alarming). We certainly see a fair few advocates saying the future warming will have catastrophic consequences, but aceptics find that a tad difficult to swallow because it is based on modelled assumptions about feedbacks which have not been proven to exist. I will move earth and sky to be in Emerald on 19th June! Thanks Jo and whoever else organised this tour! What a shame CAGW believers, it may take a while, but in the end the truth will out. It’s hard to believe all the hand-waving that goes on about fractions of a degree’s difference when the data has been collected so poorly. Count me in on June 29 – do you want a hand with anything? If you really don’t like the little face that pops up with your comments, click on the Guide for Comments in the (leave a reply area,) follow the link to Gravatars, register and upload an image of your choice. And yesterday he repeated the Coalition’s refrain that since the backflip by the Prime Minister, Kevin Rudd, who delayed his emissions trading scheme until 2013 at the earliest, the Coalition stood as the only major party with a clear policy to combat global warming. ”Climate change is a special challenge,” it said. ”There is some debate as to whether the planet is warming; if it is warming, whether human activity is contributing to that process; if the first two points are true, whether there are negative consequences. ”The majority view of scientists around the globe is that all three points are true.”..
What, are you kidding me? Monckton has been going around claiming that it’s been cooling since 1995. In the last thread, people were responding to me left and right saying that CO2 can’t be driving temperature because it keeps going up even during the “current cooling” period. Many rational skeptics are willing to concede that some warming has occurred over the last century, say about .75c, give or take, in part impelled by the climate shift out of the little ice age, but no doubt helped along by land clearance, rising population, UHI effect on T-records as cities expand and, yes, the development of a hydrocarbon-based economy. What the skeptics are really skeptical about is unfounded apocalyptic prophecy that seems designed to frighten citizens into surrendering a fair chunk of their civil liberties and incomes to politicians who promise to legislate fine weather from the capital. Canberra, which can’t even complete a divided highway between Sydney and Brisbane, imagines that it can successfully practice climate control from parliament if only they had more power to regulate our lives! And what skeptics are really pissed about is the abuse, misuse of the scientific method and peer review ethics by CRU and other researchers who produce research but hide the data so that it can not be transparently tested by independent third parties. This is particularly unforgivable in the age of the Internet. Oh, and btw the my I love my emoticon, because it really does look just like me….except for the tooth. I wish I had teeth. I also wanted to see what my icon would be…how did you know I wear glasses? BTW you’ll all no doubt be saddened to hear that I’ll be in Coral Bay on the 29th of June and unable to attend. Jo’s got the best “icon” of all. $4,000,000,000 / 1221 ~ $3276 per station? A steep price compared to when I was young , lived on an island where we voluntarily reported daily records once a month to the MET office. This was pretty much a class 2 station. I have no idea how they do the work in USA, but it appears to be a very expensive way. There is no evidence that Australia is warming from the hours I’ve spent examining the BoM data record. Most sites show maximum temperatures falling slightly offset by minimum temps rising due to UHI. The “On the reliability of the U.S. Surface Temperature Record” is published by NOAA. Of course this publication has to reflect perfect return for their $4,000,000,000. This is pretty much like having the police investigating complaints about the police. Yes, I agree, and that is the point … the average global temperature just happens to be showing a warming trend of less than the margin of error for any particular measurement … it is rubbish. Founder of the Petition Project to run in 2010 congressional race. Wise Republican voters selected Dr. Art Robinson to represent them in the November 2010 Congressional race against Democrat Peter DeFazio. Arthur Robinson Ph.D. is also the author of How Government Corrupts Science, a paper Jo featured at the end of March. Of course the world warmed during the satellite era, the cause was a large shortwave forcing due to a 4% reduction of cloud cover. The forcing was as large as a doubling of CO2 but only resulted in 0.4deg C increase in temp. What is damming to CAGW is the lack of sufficient warming, there should have been 2 deg rise in temps, there should have been an increase in water vapour, there should have been a tropospheric hotspot, there should have been antarctic warming! By the way I love my picky! Falsification of data of all kinds for economic reasons became a way of life in Soviet Russia, so temperature data would have been no exception. One could imagine what a local soviet official in some faraway Siberian village would do during the bad old days of Communist central planning, when he knows that his village’s fuel supply is allocated according to how cold his community is? Of course he will record lower temperatures in his log than his instruments show in order to justify an increased fuel allocation. With the demise of communism, such a life-or-death motive no longer existed and temperatures would then be recorded correctly. This would give the impression of a post-communist warming – which is exactly what has happened at many Siberian sites, a warming which is not evident outside Russia at similar latitudes such as Alaska and Finland. Oh I do love this. The word “Many” is an equivocal word; as is the word “seem”. How many is “many”, three, five, nine? The use of an equivocal word in a sentence totally nullifies the meaning. It means that you don’t know how many; you can’t put a quantity on it. It could be zero for all you know. I would accept it if you said, “Skeptics who believe in the tooth fairy want to imply … “, because at least that is unequivocal in regards to a belief in the tooth fairy – it defines an “acceptable” sub-set. And while I am taking the trouble of responding … you still haven’t commented on all the points I raised in my #16. I’m aware of that info which is why I made the remark. Plus the fact that many of the measuring devices are located next to the vast heat pipes that serve the community. It’s not every man for themselves when it comes it heat up there – the state provides the heat source and most measuring devices are located near to them. Russian UHI. And what’s wrong with believing in the tooth fairy? Geez. Baa Humbug, I see your point and your assumption could turn out to be right. However, this is first of all pure speculation and it could be the other way around. It could be that the thermometer readers in the “bad old days” put a lot of prestige into doing precise measurements. The best thing is to compare with other methods of reading the temperature, like the satellites, and preferably from another organization not related to the one doing the thermometer readings. In the specific Russian case, it is more likely that the old temperature gathering was more correct, because finance to fell drastically after the post USSR period, thus reducing maintenance of hardware and funds to keep measurements going. I can hardly understand how Australia – country so sensitive to carbon industry prosperity not only at home but also on the globe – can elect someone with a green-suicide policy. It kills also prosperity in countries less sensitive to that kind of industry. Well, Janama @ 37, Good to see you again! You know I consider you an old friend and ally but you’re really exaggerating that claim a bit. Heck, you might be right, but what’s the point? It is well established that there was a so-called Little Ice Age, the end of which rather nicely dovetails with the uptake of the coal-fired Industrial Revolution in England first, then America and Europe. So there was natural warming occurring in the late 19th and early 20th century that could have been augmented by that first extra 50 ppm CO2 added by the early Industrial Revolution (not to mention soot and deforestation.) Recall that climate is most sensitive to CO2 atmospheric concentrates at low levels and rapidly declines as the levels increase to the point where today the next 100ppm means almost nothing. There seems little doubt that it’s warmer today than in the Victorian age. Now, you might point out that there has been no warming in this century, but I don’t find that argument particular important because climate trends are likely to be only apparent on the scale of 50 to 100 years. True, the IPCC models scenarios for various levels of apocalypse have already been shown to be ludicrous. The apocalypse as usual has been postponed. Again. It might not seem like it yet, but the CAGW movement has entered the later stages of decline. We should be magnanimous and make it as easy as possible for CAGW researchers/supporters to detox and step back from formally hardened positions. We should reach out to them and concede that yes, of course, the so-called greenhouse effect is real, that’s why Earth isn’t a snowball. We can empathize with their not so irrational fears for the future of Gaia. Every generation has it great fright. There will be new irrational fears come tomorrow. We’re all merely human and compassion is good. Thankyou sir and your point well taken. I do agree with you that people in positions of responsibility were more fastidious about the quality of their work in those days than they are today. It all adds to an uncertain database though does it not? I can’t let you go without asking about your very interesting screen name. Is it a well chosen screen name or an unfortunate similarity? Hammy~ what part of ‘natural cycles of warming and cooling’ do you not get? Yes Wes – we are really seriously concerned about temperature. I have this figure here, let’s call it Zero, and we have been warming outrageously to another figure which we’ll call One, well we haven’t quite made it yet but we are heading there. Between Zero and One is the unprecedented warming we have experienced over the past 150 years. We should all be seriously concerned about this because if we are not careful it could make it to 2. God help us. This morning it was 10C, by midday it was 22C – we are so frivolous the way we tempt temperature. It could be that the thermometer readers in the “bad old days” put a lot of prestige into doing precise measurements. Umm, I don’t think so. Any job that required you to go outside, in winter, in Siberia, in a blizzard, was not considered a prestigious job. You could probably count the number of people who enjoyed doing it, on the frostbitten fingers of one hand. And what’s wrong with believing in the tooth fairy? I don’t know – ask wes george #29 – he brought up the subject of teeth. Can’t wait. Will be booking my ticket for Adelaide tomorrow. Baa Humbug, my screen name is my author name/alias and has nothing to do with the activist James Hansen, if that was the similarity you thought about. Yes, there certainly are problems with the thermometer records and that goes for most countries I know of. I think the problem is that, in our wish to extract conclusions of high precession, we use the data for more than they originally were intended for. My understanding is also that satellite recordings are more precise and more covering, so why in the …. don’t we concentrate about these data instead, Okay, I know they don’t fit the political bill so well as the old alcohol thermometers. Secondly, of cause, you need a period of 60 years in order to distinguish weather from climate. So far “climate Scientists” do not have the data accuracy necessary to do the analysis they say they are doing. They need good data for at least 200 years before they can do an analysis and they do not have it. 200 yrs worth of data is need to cover the ocean oscillations and the wolf solar cycles as well as the carbon cycle. Excuse me? The US has the most complete coverage and the most accurate sensors out there, and it is too noisy to make any historic conclusions from? This is headline news! Go to page 36 in the pdf linked below to find this little confession. A J Strata addresses one of my major concerns with “global Warming” I mention this because as a working scientist I have always been bothered by the tenth of a degree signal found in the data. I know you can not measure nanometers with a yard stick and that is what was done. Now A J has provide the proof of what I was thinking. “There is no way a tenth of a degree signal can be detected when the data used has stated error levels of 1-4°C! I still don’t understand why this document has not been used to bludgeon the IPCC into admitting it’s conclusions are based on unsupported math. Like MattB above, I am somewhat bemused by the choice of Narrogin in WA. Surely Albany or Geraldton, having much larger populations, would have been more suitable? Not that I’ve got anything against Narrogin or Narroginians. Good luck to them! Is there a big Department of Agriculture set up in Narrogin. From memory maybe a few mates of mine were based there out of Uni. It is a big farming centre… and maybe Archibald has a holiday house there or something? It is a nice enough part of the world – my apologies if I offended any Narroginians. The contention that many Siberian temperatures from the USSR may have been ‘tinkered’ with during the cold war is correct. In addition, during that same period Synoptic decoders had an unusual problem with very cold temperatures for some years. I have no idea if either of these problems have been addressed in the archives. I will note that many (all?) USAF sites in the US in those days also had a thermograph that recorded all day long, and QA the next day checked every temperature in all observations against this graphic record. Also instruments were calibrated (by base Precision Measurement Labs -PML- for example) on a routine basis. How good were ‘Weather Bureau’ obs in those days? It is hard to judge, but I would wager they were quite good. Elsewhere in the world, your guess is probably as good or better than mine. I will note however that, in general, all RAOBS during those manual processing days likely had significantly more real-time QC that any other type of observations. Hmm maybe it was Katanning? Hey Bro! I was joking with you the on my last few posts in an attempt to get a reaction out of you (which I did). Unfortunately, I fell asleep before telling you that. I am sorry about that. Although we do kid around with each other and usually disagree about all things concerning global warming, I actually like you. Excellent points made. It is my concern with the whole “measurement” problem. I find it somewhat of a stretch to extrapolate measurement of daily maxima and minima at single points to the heat content of a grid. Over time the temperature movement over a day at a a site could change due to numerous factors without the max/min changing. It also brings into question how accurate the satellite “measurements” are. Satellites do not measure temperature directly as do thermometers. The infrared they detect has to be calibrated to ground measurements, but the surfacestation that a pixel is calibrated with may not be representative of the entire pixel at the resolution of the imagery. So everything hinges on the quality and representativeness of the surface stations – which doesn’t look good. And I would still like to understand why weather stations, which are not called climate stations, do not measure GHG concentration. It would inform us a great deal if a continuous measurement of GHGs and temperature was being made. And speaking of the lack of fastidiousness in the quality of work by those in “positions of responsibility” … consider the immortal words of IPCC Chair, Rajendra Pachauri. The weight of the many hats that he wears seems to have imbued him with a very short memory for his very own words. Alas, as is evident in the following series of Pachauri postulations on non peer-reviewed literature, this leads him down a path whereby his feet are constantly marching into his mouth! He said the media and other sections of society had misunderstood the role of such information, labelling it grey literature, “as if it was some form of grey muddied water flowing down the drains”. All the temp measurements are suspect, very suspect. Most were set up for farming, flying or planting your garden. Most people cared wheather the frost was gonna kill the petunias! If your going to use these numbers in a global data base your crazy. You may as well put in last saturadays bingo numbers. I’m sure the UN could adequately defend that choice too. Roy Spencer has said that the satellites are NOT calibrated against ground stations. The sensor is calibrated on the satellite by looking at a platinum resistance thermometer on the satellite. This raises a few issues in my mind. 1. Is looking at a solid surface the same as looking at a gas? 2. The Pt thermometer is only calibrated before launch. Any drift due to ageing and exposure to the space environment(radiation, thermal cycling) is unknown. Has anyone had the wit to fly an identical instrument on the ISS and bring it back after a couple of years to do a proper lab calibration on afterwards as well? 3. I looked at how the sensor readings are converted to temperature. This seems very complex indeed. Are there arbitrary or empirical factors in the algorithm? If so how do we know they don’t change under certain circumstances? We know there are corrections for orbital drift. I’m getting less and less impressed by the “science” that’s going on here. My high school physics teacher would have given us an impressive verbal dressing down for some of the stuff going on in climate “science” if we had done it. Hello friend. Don’t you wish we were in Chicago with Donna? Just here to show off my Gravatar. Yep, it’s way ahead of all your pinky greeny smileys! Sure would have been nice to be in Chicago with Donna, BH! Maybe next year, eh?! Roy Spencer has said that the satellites are NOT calibrated against ground stations. I believe him. Given that the ground stations are not calibrated, there would be no point. Adjustment of the readings as they are factored into the models, is another matter altogether. The Pt thermometer is only calibrated before launch. Any drift due to ageing and exposure to the space environment(radiation, thermal cycling) is unknown. Does anybody know if the satellites have redundant thermometers – more than one thermometer per satellite – and if so, are the sensor readings transmitted separately, or combined (in some way) in the satellite prior to transmission? The reason I am interested, is that redundancy will tell you if there is any “drift” in one, or both, of the devices. It won’t tell you which one is drifting, or even the magnitude of the drift, but at least you know you have a problem. Exactly- temperature readings were never originally designed to create a national, let alone global, temperature record, but to record local conditions for local users eg how hot is the air above the runway when about to land. the temperature record in Australia is erratic, missing vast amounts of data, subject to site change and UHI,also subject to deliberate manual adjustment, so how anyone can claim to know what the “trend” is I don’t know.. But I would go with a small increase in (some)minima and (fewer) maxima- nowhere near what BOM says. I like my Gravatar. It looks nothing like me and who cares? And the finger pointing goes on apace, occasioned apparently by the visit of Anthony Watts to Australia. With apologies to the naysayers, I wish I could be there to hear him speak. He has a lot more to say than just the poor positioning of ground based thermometers. This by the way violates NOAA’s guidelines for location of such thermometers and speaks volumes about the general attitude of the U.S. Government about following its own rules (what’s new?). Credibility is a big part of what this is all about and it begins at home by following your own rules, even when it’s inconvenient. If you’ll take little liberties, what big liberties will you take? Need I mention the august Dr. James Hansen for instance? Grow Bulb I need to know how many lights I need for my indoor grow room.? Your biggest problem is that the temperature record has already diverged significantly from the temperatures predicted by the IPCC. According to their predictions, it should already be SIGNIFICANTLY WARMER than it is now. Unfortunately (for you, but fortunately for most people), the temperature trend was nearly completely flat in the past 15 years, and has now started to trend downwards from it’s highs, just like it always has in the past. Climate is cyclical and perfectly 100% natural. There is nothing you or I can do about that. Monckton doesn’t say there is cooling since 1995, he says that there has been no statistically significant warming in the past 15 years, and it appears that in the past 2 years or so there has been cooling. In fact, it was not Monckton who ORIGINALLY said this, it was Phil Jones! 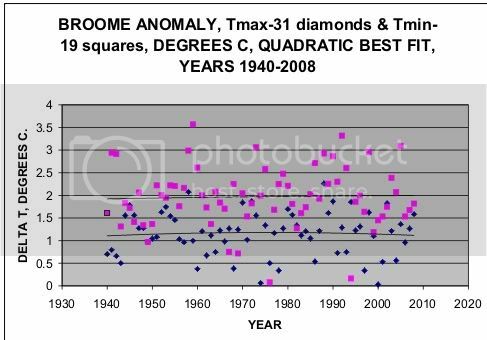 Any idea why Broome has not changed at the obligatory 0.8 deg C per century? Any idea why so many other Australian sites have not changed greatly either? Here’s a bit of global fun. People often say that early years were lowered in temp records, some to correct for Stevenson screen introduction. Some say that UHI is undercorrected. So I took the “iconic” IPCC graph and adjusted it in accord with these accumulated criticisms. (a) Temperatures before 1950 were increased by 0.2 deg C. (b) the trend after 1950 was lowered so that it ended up at 0.4 deg anomaly, to correct for UHI & some other adjustments. This is my answer to those who state that critics do not accept that there has been climate change in the last 100 years. Of course, most people do accept that. Broomes’ temp is influenced mainly by cold desert Easterlies during the dry season, and warm moist Westerlies during the ‘wet’ season. We are (on a small peninsular) surrounded on 3 sides by the sea, and the water temp. has a large influence on our annual figures. This year, sea temp. has been much higher, causing an average minimum for the last 3 months (Feb-Apr) to be 1.8C to 3.3C above average (barely noticeable to us). The last 60 years has seen an increase of only 0.1C min and max over the previous 50 years where the BOM site was at the Post Office, 1 mile from its current position near the airport. This has to reflect that the mean sea temperature has pretty well remained unchanged all that time, and sometimes can have large swings like this year. Are you concerned about climate change? Are you concerned by the current debate that seems to call into question climate science? Are there reasons to doubt what scientists are predicting? This 90-minute event will present 4 brief talks by UWA scientists who are experts in various aspects of climate change, followed by an opportunity to ask questions of the speakers and discuss the issues with a panel of experts. Looks like a big “AGW-kumbaya hug session” by AGW-believing scientists, and having Stefan Lewandowsky speaking on “consensus in science” lends little to the credibility of the forum. Funny that this forum is on the day before Anthony Watts comes to Perth. There’s plenty of data showing the southern hemisphere is warming. The loss of glacier ice from Artarctica is a pretty good example of physical evidence. Except there is no such connection. David’s ‘analysis’ is as invalid as they come. Somebody once labelled it ‘the worst sun-climate paper ever’. Saw them when they came to Hobart, have to say was not even a little bit impressed there were several scientists in attendance who took their arguments apart and Watts et al had no real answer to the scientists points, I bet if they ever do this again, they won’t come to a University with a climate science department, whoops! 1. Watts et al raised the usual point on CO2 levels half a billion years ago, when pressed by the 5 scientists, 2 from CSIRO, 2 from ‘Uni of Tas’ and one from AAD (Australian Antarctic Division) on why no mention was made by ‘skeptics’ like Lord Monckton (and the speakers) as to the quite solid mitigating factors like continental drift, lack of land based life (albedo) or the lower output of the Sun, these speakers had no answer. 2. The point on Cosmic rays was also raised again when pressed on the fact that the original papers were shown to be incorrect by a number of follow up papers no real answer could be supplied. 3. The claim of cooling since 1998 was also made, again the scientists asked why no mention was made of the record El Nino 97/98 was made which lifted 98 well above the mean, and made it a rather silly starting point for any claim of cooling, again no real answer could be given. 4. The CO2 lags temperature argument was also put forward, again the scientists asked how this disproved global warming given that the rise in CO2, even if it does lag in natural events is still linked to increased warming in those natural events, clearly showing CO2 was a warming agent. Again no answer!